Are you a Marketer? Do you often use Project Management Tools? Well, It’s always a little frustrating when you have a deadline to finish a project sooner, but you couldn’t find a perfect application to the work quickly. There are some fantastic project management applications out there that will help you to get your job done quickly. Previously, I wrote an article about Aceproject that scrutinizes all your project details, schedules, and expenses. There are other popular platforms as well. For a Digital Marketers or Project Managers, these tools are a boon, but most of you would agree with me that each of these platforms has some limitations for sure. Finally, Today I’m back with a fantastic add-on for these platforms. It’s the new Bridge24. So without any further talking, let’s start the review of this powerful add-on. 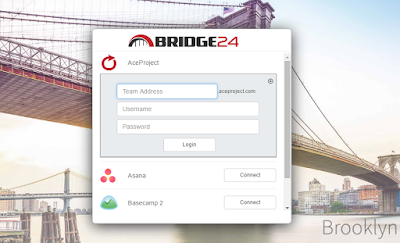 Bridge24 is an add-on for tools such as Trello, Basecamp, AceProject and Asana that extends the functionalities and productivity of all the major project management tools. It simply helps you getting the vague features from all those traditional platforms but with an easier approach. It easily integrates and connects with all the applications, making the users more accessible to all the features. It also gives you benefit to more control of the data and able to reach the information anywhere regardless of the time and location. Bridge24 boosts your productivity with all these new features and dynamic connectivity options. I am already using a modern management tool; why would I need an add-on for it? While developing such a significant management platform with such vast features and functionality, companies accidentally compromise with the ease of access and end up creating it more rigid or confusing. More Importantly, add-ons like Bridge24 boost up the performance of such platforms by making it more dynamically accessible for the users or marketers. So, Bridge24 is a must if you’ve struggled enough with the complexity. Nothing would change, you’ll get all the core functionality of the platforms, just more efficiently and accurately. To start using this remarkable tool, you’ll need to sign up and connect your platform account with Bridge24. For ex, if you’re using AceProject, then you’ll need to log on the platform with the Team Address, Username, and the password. Moreover, others would lead to directly to the dashboard for authorization. Since Bridge24 is in a growing stage, it currently offers all the services free. Yep, FREE! Click here to JOIN NOW! FREE! Bridge24 is aimed to provide an improved user experience with its intuitive UI coupled with pop-ups, windows, and a minimal dashboard that gives an eagle eye for all the ongoing processes. Editing tasks seem to be more fun and easy when you get the extended features such as bulk actions and groupings. Most of the features and the layout is kept similar to all the PM platform. So, you can easily access all the Modal settings and ability to save them later too. You are entitled to carry one or multiple tasks simultaneously. All in All, it is the revamped version of all the standard management tools. With the recent updates, Bridge24 has included a remarkable preview feature that makes it easy for users to look out all the necessary files or documents. View, edit or manage all kind of records, images or PDFs with just one click. You can even select the files in bulk. Improved Powerful View and Flexible View options make it easy to update or manage calendars, schedules, and reports. You can easily adjust the documents for any further modification seamlessly. It widely offers the quick access to all the projects and other operational data from the platform database. You can control most of the essential operations in the parental platform directly through Bridge24. Track all your charts, tasks and project with more accuracy and boosted performance. So, this was my take on a very powerful add-on for all the PM tools. Whether you’re using AceProject, Trello or Asana, Bridge24 is a must recommendation from my personal view. After testing out all the extended features, intuitive design, and support that it provides to its users. The product is free to use, and you can easily connect it with your management platform directly. Based on a thorough testing, I’ve already advised most of my Digital Marketer friends and with so many positive feedbacks and review, it is a definite recommendation to carry out all of your daily SEO operations quickly and proficiently. Don't hesitate to share your thoughts in the comment section below and do let me know if you’ve tried out this fantastic tool or add-on. It's still in the beta stage, so a lot of features are going to be enhanced soon with the launch or update. Cheers!